I’m lucky to have two fabulous jobs. 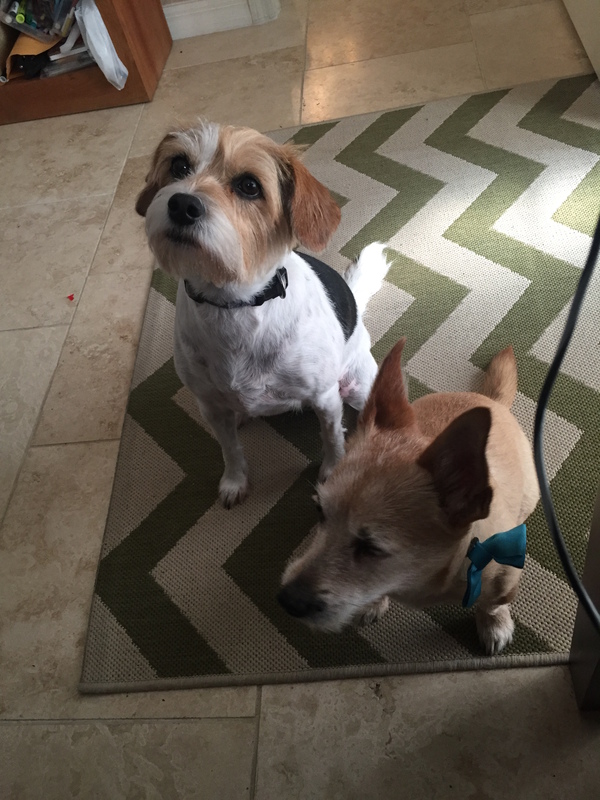 I’m a community manager at Articulate—but I’m also Mom at the Rimmer Home for Wayward Youth and Dogs. What title do you think really captures your roles and responsibilities? I’m not big on titles or labels, but over the years I’ve jokingly referred to my job as being a learning alchemist turning leaden content into e-learning gold. My preferred title is just designer, because it speaks to the essence of what I do without being over the heads of most people. What devices do you love to use? I’m in a long-term relationship with my coffeemaker, but my iPhone is tops on my list of favorite devices, with my iPad close behind. I’m also smitten with my Nest thermostat. What software tools do you love? I also love Mailbox for my email client. The simple act of being able to schedule email to appear when I’m ready to deal with it was like a task management epiphany. And my list wouldn’t be complete without Dropbox—which has saved my professional life on more than one occasion! I’m very fortunate to have a small home office. But because it’s small, my husband and I don’t have room for separate desks so we repurposed our former dining room table into a large desk for two. 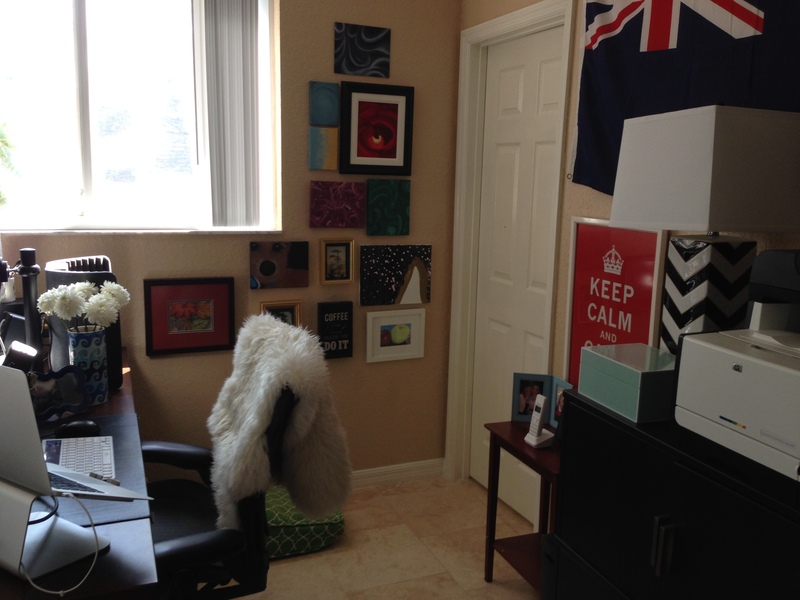 This is a picture of my half of the office. I’ve got a fab 27” monitor and my 15” MacBook Pro monitor on my desk. My space has an art corner full of paintings my kids and I have created together, and our New Zealand flag to reflect my husband’s Kiwi heritage. I also have my mini recording studio and a cushy pillow for my dog assistants, Logan (the tan one) and Scout (the white and tan one with the floppy ears). Despite being small, my workspace is a fairly harmonious balance of his, hers, and theirs, except for the occasional turf battle of the 27” monitors. What is your creative or design philosophy? When we opened the box to install our Nest thermostat, it was kind of a big moment for me because it crystallized some notions I’d had around the difference between good design and so-so design. The Nest taught me to appreciate the importance of empathy for the user; a particularly relevant lesson for e-learning design. Case in point: not only did the Nest come with super-easy-to-follow instructions and a beautiful intuitive interface, it also came with all the tools anyone would need to install it. Even better, once installed, it lowered my electric bill and put me in control of my energy consumption. The designers of this product literally thought of everything that would stand in the way of me being a successful consumer. This level of thoughtful detail was so refreshing and it made so much sense. With the barriers removed, I could talk about how much money I was saving on my electric bill and how awesome and smart I am as a consumer, rather than what a pain it was to install a thermostat. From beginning to end, my user experience was defined and designed for my personal success—not just for me being a better user of Nest’s product. When it comes to designing e-learning, so much of what we do is about empathizing with individuals. Empathy comes into play in nearly everything we do, from the tone of our writing to the creative treatments we choose to the content story we coax from all the bullet points to the navigation we design to make it all easy to consume. What books or blogs have been influential to you? I love to read and some of my most personally influential books are Frankenstein by Mary Shelley, To Kill a Mockingbird by Harper Lee, and The Giving Tree by Shel Silverstein. From a professional standpoint, some most influential books are Made to Stick by Chip & Dan Heath, Better Than Bullet Points by Jane Bozarth, Design for How People Learn by Julie Dirksen, and Don’t Make Me Think by Steve Krug. For blogs, Tom Kuhlmann’s The Rapid E-Learning Blog has been tremendously influential to me and Cathy Moore’s blog is a must-read for any designer. Enough about me. Tell me a little about you! What’s your design philosophy or favorite source of inspiration? How do you work? And while you’re at it, follow us on Twitter and come back to E-Learning Heroes regularly for inspiration and helpful advice on everything related to e-learning. 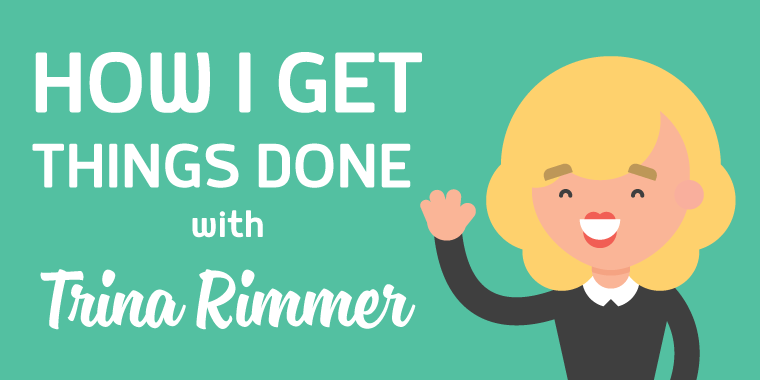 This is the first in our new series, "How I Get Things Done". We'll share insights from Articulate staff and community members on how they approach their work. Trina, Really great post, I love all the professional books you mentioned. My tasks are all over the place for work with not enough dedicated time for project work especially eLearning which takes dedicated creative time to just get buried in Storyline. My latest method - capture everything (ala GTD) in Asana - and turn off email and everything but Storyline 2 and Creative Suite applications to get to some serious building of eLearning as rapid as I can design/imagine (with frequent Google-search-Learn sessions where I try not to go down the Rabbit Hole with just-enough info to get the task done relatively efficiently). Also just printed out list of Storyline shortcuts so I can be even more efficient. Taking the time to learn shortcuts in your dominant creative tools pays for itself 10 fold in time! Hi Nick! Thanks for reading & commenting. I'm with you; it's really cool to see how other people get their projects done. I learn so much from others and my favorite things to learn are those time-saving tips like keyboard shortcuts and helpful apps for getting organized or working smarter. Oh, and the Google. Gotta love the Google. So good to read this very nice, seems very familiar to me. Trina - thanks for sharing. One of my favorite books on learning is one of the ones you mentioned: Design for How People Learn. I've read numerous ID books and Julie Dirkson has a way of making instructional theory so much easier to understand. I agree, Scott. Julie's great at taking complexity and boiling it down in a way that makes perfect sense. Bonus: She's also super nice and super smart. Glad you enjoyed my article! Trina, your description of NEST succinctly paints the perfect image of good design. I'm new to these forums, but with people like you and Nicole Legault writing, I know I'll continue to learn and be inspired. Thank you so much. Aw. Thanks, Denise. I know Nicole is just as touched by your kind words. In fact, I think you just made our day! Hi Trina! We met briefly at the DevLearn Expo after your session, Putting the “Pro” Back in Your Review Process. I took your advice and added a how-to here (https://community.articulate.com/discussions/building-better-courses/an-elearning-review-webpage-for-improved-reviewer-experience-and-feedback-quality) on the community.